The hybrid map/amusement park will be coming to life for Overwatch players in less than a week! Overwatch had a wonderful 2017 that saw the pieces fall into place for Overwatch League and possibly even resulted in the death of another FPS. The tease for Blizzard World, a new map for Overwatch players, was a part of that great run in 2017 and entry to this new magical place will set the pace for 2018. Grab your ticket below. 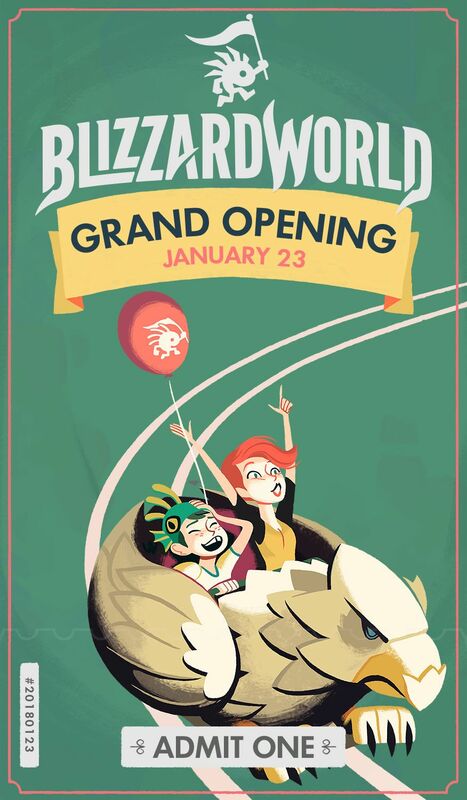 Blizzard World opens January 23. The announcement of Blizzard World's opening day was announced on the official Overwatch Twitter account along with a link to this lovely park ticket, keeping with the new map's theme. As seen in the trailer below, Blizzard World pays tribute to all of the developer's biggest titles. Overwatch players will be pushing the payload across Azeroth (World of Warcraft), Tristram (Diablo III), Koprulu Sector (Starcraft), and more.